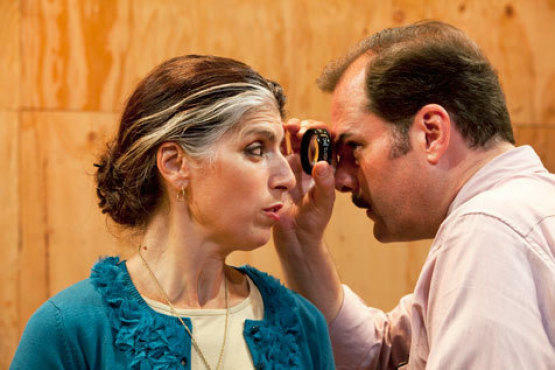 A Greek immigrant can't see straight in this quirky new play. APT PUPIL Mancini, left, gets her peepers checked by Smith. Her name is Diamondo, but she goes by Mondo, Italian for world, also the root for mundane. Implications of banality may be superficially apt: This middle-aged Greek immigrant’s tone is listless, she stares blankly and drones in a yogurt-thick accent about her painfully dull existence in small-town Pennsylvania. But don’t be fooled by Linda Mancini’s deadpan, nor that of the equally superb Jay Smith, playing a shy ophthalmologist trying to help Mondo regain her diminishing sight; these lost souls possess hidden depth. Dimensionality is an ongoing concern in Christina Masciotti’s marvelously strange and humane two-hander, sharply directed by Richard Maxwell. When an eye-patch-wearing Mondo complains to Smith’s Dr. Hull that everything appears flat and undifferentiated, she’s talking about more than depth perception. As an immigrant going through a vicious divorce from her traditional Greek husband in a foreign country, Mondo is unfixed. Not only is she unable to judge the distance between objects, she can’t even locate herself in the world. Her sessions with Hull might help things come into focus—emotionally, culturally and otherwise. Maxwell brings his customary stripped-down, affectless style to Masciotti’s script, which lends itself to deadened delivery and awkward pauses for comic effect. Vision Disturbance actually bears some similarity to Maxwell’s 2004 Good Samaritans, in which a hopeless drunk was saved by a no-less-lost social worker. Hull suspects that Mondo’s occluded vision has more to do with stress than anything somatic. Rather than opt for surgery, he prescribes music therapy. The patient scoffs but finds that attending symphonies or banging on a piano releases demons. Masciotti’s language is beautifully wrought: a keen interplay of the boring and the weirdly poetic, evoking both silliness and pathos in Mondo’s pidgin syntax and Hull’s repressed small talk. And even though romance enters the picture, Vision Disturbance is more than a simplistic tale of illness and recovery. In allowing the characters to remain opaque, the creators embrace obscurity. Abrons Arts Center. By Christina Masciotti. Dir. Richard Maxwell. With Linda Mancini, Jay Smith. 1hr 10mins. No intermission.